Brandon Ballet will present four performances of The Nutcracker, your favorite holiday tradition, with new choreography by Doricha Sales, Artistic Director, and music by Tchaikovsky. This 24th annual production features talented professional, pre-professional and company dancers, lavish costumes and scenery, and an infectious score that will mesmerize children and adults alike. 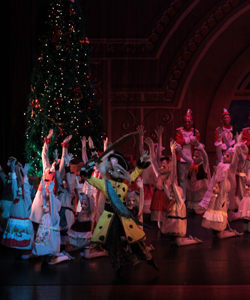 The ballet tells the story of a little girl named Clara who, on Christmas Eve, receives a wonderful gift - a wooden toy nutcracker from her mysterious uncle Drosselmeyer. The toy leads Clara on a magical journey through an enchanted winter wonderland with dancing snowflakes and the elegant Snow Queen. Then Clara travels to the Land of the Sweets where she meets the regal and majestic Sugar Plum Fairy who takes her on a whirlwind magical trip. 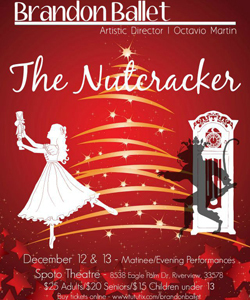 The Nutcracker is a classic that has been dazzling audiences of all ages for years; a wonderful ballet for the entire family.